Harry and Claude de Baissac parachuted near Nimes in southern France in July 1942, but both suffered injuries. De Baissac only sprained an ankle, but Harry broke his leg in several places. After several weeks in hospital he was moved to Cannes, where André Girard's 'Carte' resistance network took him in. Harry's local SOE contact was Captain Peter Churchill, who helped find a safe house and tried to secure medical help. While in Cannes Harry was also introduced to a young resistance helper, Jacques Poirier, who became his personal assistant. When relations with the Carte network broke down in November, Harry and Jacques left the Riviera for Spain. 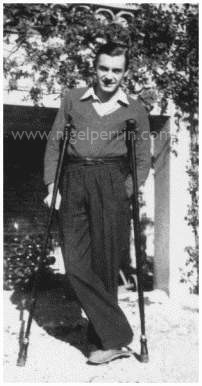 Despite being barely able to walk, Harry managed the extraordinary feat of crossing the Pyrenees, but both he and Jacques were arrested by Spanish border police the following day. Desperate to return to England, Harry was able to escape during a hospital visit to Zaragoza and reached the British embassy in Madrid. Jacques was released shortly after and flown to England, where he also joined SOE and began training as a secret agent. During his time recuperating in London, Harry was introduced to Violette Szabo, a young widow from south London. Following their meeting, she was approached by SOE and accepted for training as a courier. They became close over the summer but Harry knew that they would soon be separated, as plans for his return to France were already underway. on the French Riviera, 1942.